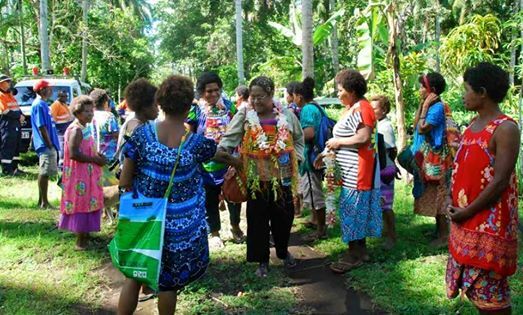 A NEW piggery project in Rai Coast district of Madang Province funded by Mineral Resources Authority (MRA) was officially launched and handed over to the Basamuk women group last Saturday March 6, 2016. The project is funded under the Women in Mining Small Grant Program at the cost of K87, 000.The project aims to reduce poverty and improve livelihood at community households units through creation of income earning opportunities. This is a seed project intended to supply piglets to other smaller beneficiary farms at the gradual expansion of the project.The project was constructed by Ramu NiCo Agriculture Officers last yearSeptember and ended on December with a building capacity that can hold up to twenty pig. MRA Manager for Sustainability Planning Development Coordination Division, Stella Brere,who officially launched the project,said it is the first piggery project in the Ramu Nickel impact area of Madang funded by MRA. Ms.Brere said with the project, MRA is happy to see Ramu NiCo as a successful and important partner in development and will continue to work closely with the mining developer in any future developments. “Although it is a small project we believe it’s a good initiative, we are happy to support this agriculture initiative in Mining Industry as we believe it is a sustainable project and will expand and create positive impacts at community level" she added. Ms.Brere added that MRA wants the partnership with RamuNiCogrow and to see landowners support the Women group not only in Basamuk but other three landowner areas with the help and support of Ramu NiCo Community Affairs Department. RamuNiCoBasamuk Refinery Vice President Juan Xu said since the construction period, the Company was always committed to set up a better relationship and contribute more to local economic development. MrXu thanked MRA for setting up the special project, and said Ramu NiCo will fully support the piggery at Mindre village and assist in any ways it can. RamuNiCoBasamuk Refinery Community Affairs Agriculture Officer Tony Gayu thanked MRA for recognizing the need of the women of Basamuk. “The project is successful because we had work hand in hand with MRA and happy to receive the project from MRA for our women’s group today,” MrGayu said. RamuNiCo Agriculture Supervisor Allen Wawah thanked MRA for the public private partnership approach while challengedBasamuk women to take ownership of the project into another height in the future.